Mathematical Musing: Is Algebra Necessary? Prevents us from discovering and developing young talent. In the interest of maintaining rigor, we’re actually depleting our pool of brainpower. This post is not to explore the virtues or flaws with Professor Hacker’s arguments, but to point out what many bloggers have recently observed: that the New York Times answered their own question last week in an article about Sony’s controversial movie The Interview. The movie in question, you may have heard, was pulled from theatrical release on the 25th after the studio’s computer network was hacked and threats were made against theaters showing the Seth Rogan/James Franco comedy that depicts the two actors as journalists asked by the CIA to use an upcoming interview with North Korean president Kim Jong Un as an opportunity to assassinate the dictatorial leader. After public outcry from major Hollywood figures and even president Obama, Sony released the film in independent theaters and online. 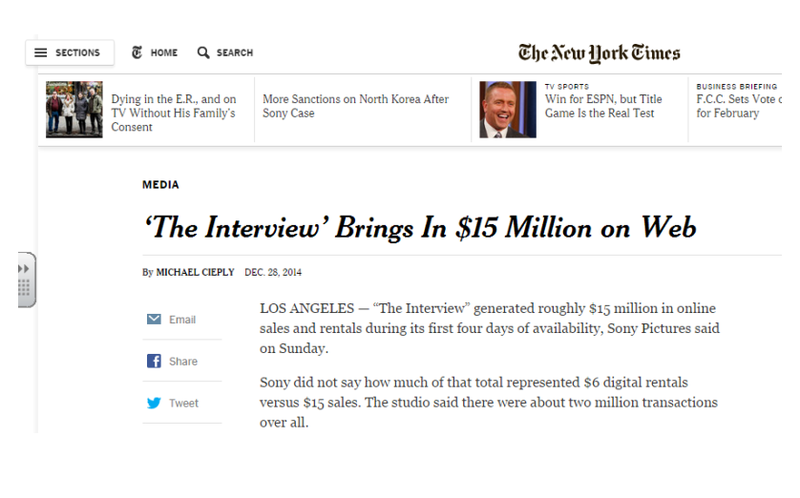 The December 28th NYT article discusses the amount of money Sony earned off of online sales and rentals, but observes that Sony “did not say” how much of the $15 million revenue was from each source (sales vs. rentals). It would appear that Algebra was not reporter Michael Cieply’s strongest subject either, as there is enough information in this article to set up and solve a simple system of equations to answer that exact question. Let s = the number of $15 sales Sony made and r = the number of $6 digital rentals. 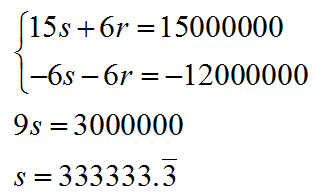 From the $15 million headline, we can write the equation 15s + 6r = 15 000 000. The second paragraph also tells us that there were about two million transactions overall. Therefore, we can make the second equation s + r = 2 000 000.